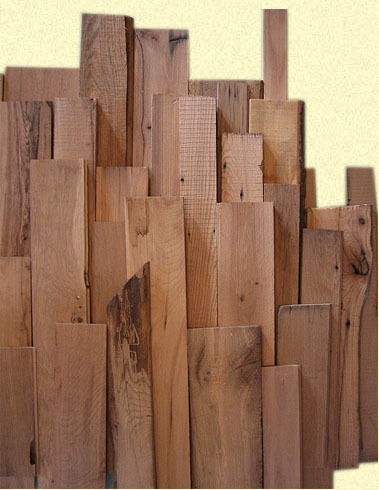 Here’s a nice assortment of quality reclaimed hardwood for crafts and other hobby work. Birdhouses, craft boxes, intarsia, doll house furniture, small shelves, shadow boxes, and even some night stands are possible with this collection of wood. While we used to ship assortment packs, it just became too difficult and cost prohibitive. However, if you’re near the Minneapolis / St. Paul metro area, you are more than welcome to come out and pick off our scrap wall. Most of the material that we have around is cut-offs from the table, mantels, and countertops that we make. We also tend to have a few unmatched boards that are leftover from making making tables and such. That is, we got ten boards, used nine, and had one left over. Some have a planed surface with tongue and groove edges, while others are rough sawn. Of course, these will have typical reclaimed character marks such as: worm holes, varying patina, nail holes, broken nails, knots, cracks, and even the occassional bullet or shotgun blast. Red Oak, White Oak, Red Elm, Yellow Elm, Rock Elm, Ash, and Maple are all available. Specify a mix or an individual species. Our location is shown in the contact us, but please be sure to call ahead to make sure we are around the shop.